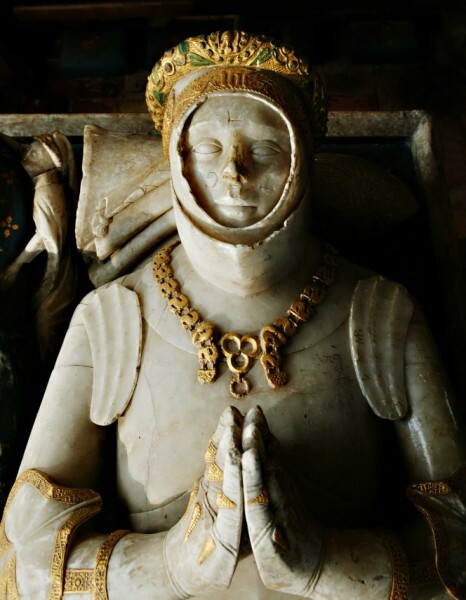 Forum Index > Historical Arms Talk > English bascinets? Posted: Fri 17 Feb, 2012 8:33 am Post subject: English bascinets? 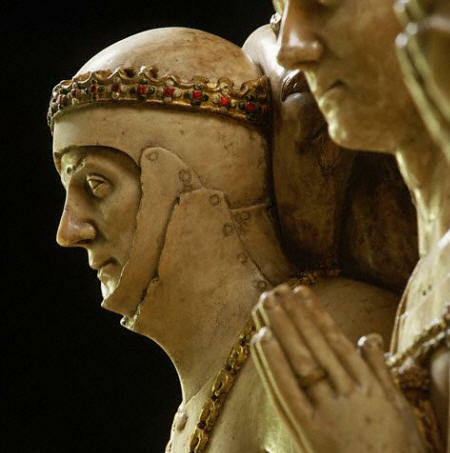 My question is, what evidence do we have about how these three parts fitted together, and are there any good images of reconstructions? Posted: Fri 17 Feb, 2012 12:12 pm Post subject: Re: English bascinets? 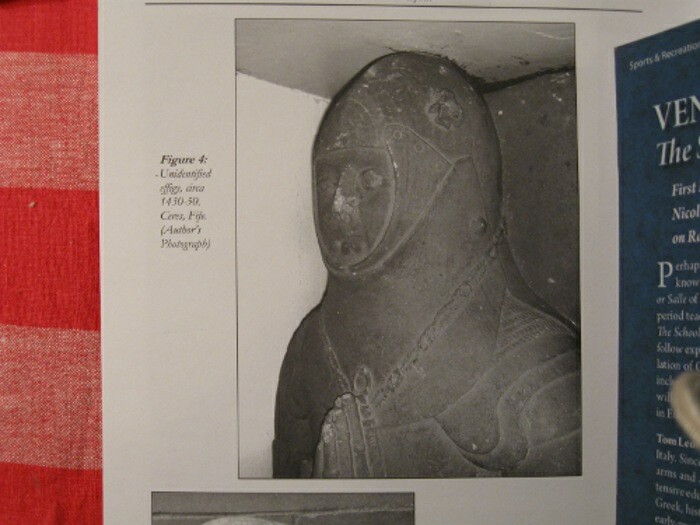 Journal of Armour Research Society vol1 ISSN 1557-1297, has an article on 3 15th C effigies in Aberdeen. A little late for your question, 1420ish to 1450ish, but on page 8 there is a nice detail showing relationship of the wrapper bevor and helmet of a great bascinet. I would post a picture but my camera batteries are dead. In addition, I have been able to collect some images and drawings of what I believe is actually being illustrated in the effigies (that being a separate iron collar that is free of the bascinet, rather than a great bascinet with attached bevor plate. 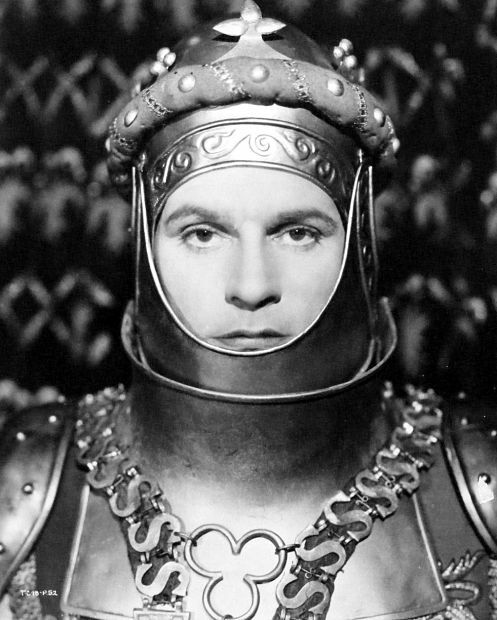 Furthermore, although I am loathe to admit it, I have also utilized images from the armor worm by Laurence Olivier in Henry V. Admitedly these seem to have taken the most artistic license from the effigies, however I believe that they still illustrate how the pieces interact sufficiently. The1st picture shown below is an image of a similar harness made by Robert MacPherson for Toby Capwell. Specifically it details the collar and helm. 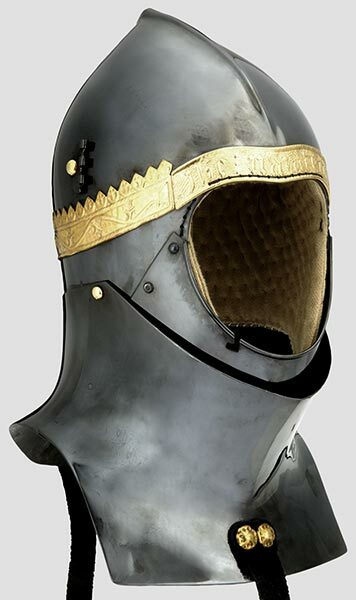 Unfortunatley, I have spoken with neither Robert nor Toby regarding the specifics of these pieces, and I have also heard conflicting reports that infact although the collar is separate, it is anchored to the back of the bascinet (so effectively would be about the same as the Grand Bascinet with bevor plate). Without verification it remains to be seen if in fact this is the correct interpretation. Robert Mac's interpretation for Toby's english harness. Thanks Neal, this is excellent information. I have seen Toby's bascinet but didn't pay enough attention at the time, as I was originally aiming a bit earlier and going for an aventail. I remembered it as a great bascinet, but looking at the photo above my memory seems to have been wrong. I had seen Gillaspie's Henry V style armour and this was what I remembered quite clearly, but I do not know how the source evidence weighs up on the effigies between these being completely separate collars, as shown on the examples above, or whether it was simply a great bascinet with a one-piece skull and back, with the front collar rivetted on (as found on some French and Italian examples surviving). Claude Blair talks about the latter continental type, but doesn't suggest that English examples were mae different with a free floating collar. Given the English manner of usually fighting on foot at this time, and the fact that free floating collars existed in the 14th century in England (as seen on the Hastings Brass) I find it fascinating that they may have used helmets that were characteristically English, rather than being like the French great bascinets with a solid and rigid back. Posted: Tue 21 Feb, 2012 12:47 pm Post subject: Re: English bascinets? Editing my original post doe not push it to the top of the stack, so lets see if quoting my post will get it to pop. My apology if the image show up twice, I am having a "fun" with computers day kind of day. Thanks Mackenzie, very useful. I wonder though if this is exactly the same type of helmet as they were trying to show on most English effigies and brasses, first because it is Scottish and I believe they followed French fashion more (for example see the visor atachment) and secondly because a number of the English ones appear not to have a one-piece back, but rather seem to show the back of the neck/gorget as a separate piece. But maybe all this shows is that there was a development from the gorget section being separate in the earlier period (say 1410-20), to the back becoming solid (by say 1425ish) and then the classic great bascinet we are familiar with? 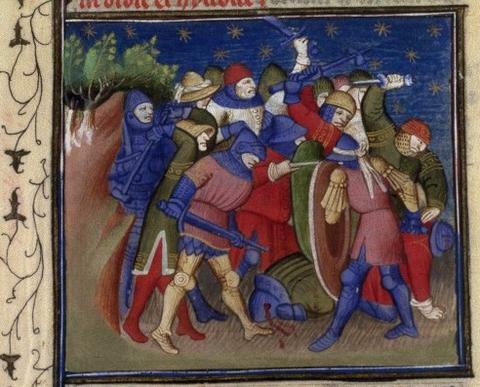 I have the impression that this illumination showed nasty foreigner in strange armour attacking. Of course the guy in the kettle hat on the wall appears to have a gorget. My triva-only memory tells me there are examples of detached gorget in the English context that are from early mid 14th Century, some of them quite famous, I will see if I can find an image or two. Yes, in the Hastings Brass of c.1349. Yep the Hastings brass and the one with the kettle hat on the bascient in the same series. Here one that I think is French, it might be useful for comparing against the Scottish one.